Saul got his start as a wee ball of stickers in 2015, crumpled together and held high as the ball got rolling. As of January 13, 2016, he was a crowned with his own Guinness World Record for the Largest Sticker Ball, weighing in at 231.6 pounds. Since then he has grown steadily, venturing out to events and enlisting help from his fans to keep growing his size by adding stickers. He is now weighing in at 320 pounds, and ready to see more of the world on his very own excellent adventure. 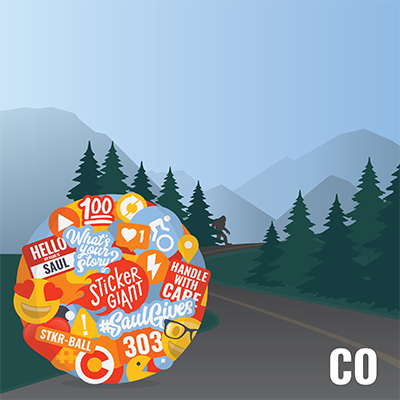 Coming up this March of 2019, Saul the World's #LargestStickerBall will take off for Saul's Excellent Adventure, and he will be visiting many destinations along the way as he journeys from Longmont, Colorado, to San Diego, California. 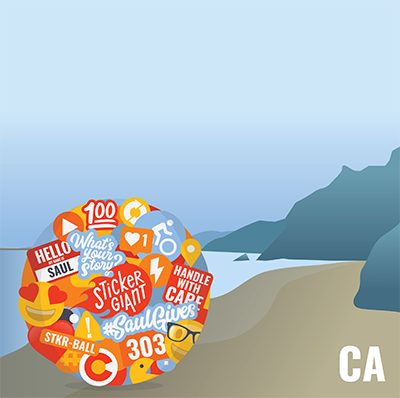 Saul's destination is the 2019 edition of Social Media Marketing World, an annual industry gathering of 7,000 marketing professionals, and he's bringing his World Record to them so they can help feed the beast with their own stickers. This road trip will be an opportunity for Saul to see the Great American West, with stops in Utah, Nevada, California and Arizona. Along the way, Saul will take in plenty of scenic sights, from Rocky Mountain views outside of Denver to the Largest Watermelon in Green River, Utah. He'll stop on the Las Vegas Strip in Nevada to try his luck before he heads to the golden shores of California where he'll dip his toes into the Pacific Ocean at Mission Beach. On the way back to Colorado, Saul plans to stop off in Arizona to check out the Grand Canyon because he loves anything that's supersized, whether it's a huge hole in the ground or a big piece of fruit. Saul will be on the road on March 18-19th, and will be returning on the March 23-24th. We invite all of our friends to follow along with his adventures on social media using the hashtags #SaulAboard and #SaulsExcellentAdventure.